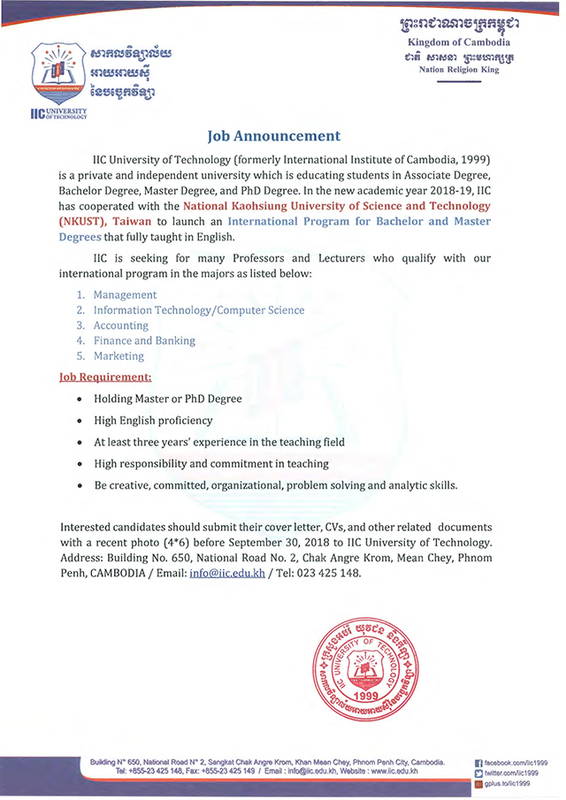 IIC University of Technology (formerly International Institute of Cambodia, 1999) is a private and independent university which is educating students in Associate Degree, Bachelor Degree, Master Degree, and PhD Degree. In the new academic year 2018-19, IIC has cooperated with the National Kaohsiung University of Science and Technology (NKUST), Taiwan to launch an International Program for Bachelor and Master Degrees that fully taught in English. • Be creative, committed, organizational, problem solving and analytic skills. Interested candidates should submit their cover letter, CVs, and other related documents with a recent photo (4*6) before September 30, 2018 to IIC University of Technology. Address: Building No. 650, National Road No. 2, Chak Angre Krom, Mean Chey, Phnom Penh, CAMBODIA/ Email: info@iic.edu.kh /Tel: 023 425 148. - Building 650, National Road 2, Sangkat Chak Angre Krom, Khan Mean Chey, Phnom Penh, Cambodia. Copyright © 2017 IIC University of Technology.